SMENCO presents two new clean air products from Germany’s leading exhaust equipment manufacturer, Kemper. Kemper products are distributed in Australia through SMENCO. The new Kemper CleanAir Tower is designed to clean air indoors where local exhaust ventilation is not feasible. The MaxiFil Clean is also a new addition to the Kemper range, allowing for convenient portability and 360-degree operating radius. 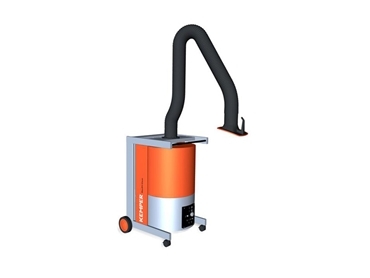 MaxiFil Clean is packed with many time-saving features such as an on/off switch on the hood that ensures ease of use and maximum productivity while fully complying with safety standards. Focused on clean air and safety in welding and cutting operations for more than 40 years, Kemper’s extraction technologies offer excellent value for money at the time of purchase, with ongoing costs also minimised using cleanable filters. Kemper products provide hazardous smoke and dust extraction during welding, cutting, or grinding applications. Kemper’s OH&S compliant welding smoke removal products are used worldwide by clients such as Caterpillar, Amazon.com, General Electric, Snapper, John Deere, Yamaha and IBM. Kemper products come with a limited warranty. SMENCO is one of Australia’s leading distributors of welding equipment, consumables, and associated welding technology from around the world.